It’s finally here: The solar eclipse. The celestial event is expected to darken Long Island’s afternoon skies Monday, bringing awe and wonder. But it also could bring serious eye injury if viewers do not protect themselves, a Suffolk lawmaker and an optometrist warned. Legis. 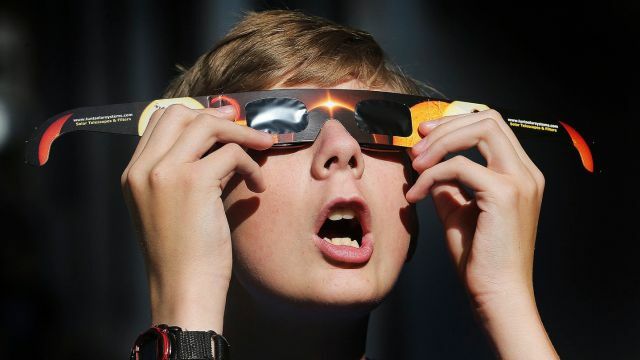 William Spencer and Hicksville optometrist Dean Hart urged Long Island residents to don proper protective eyewear to view Monday’s spectacle or risk permanent damage to their vision. Monday’s total solar eclipse will be the first to sweep coast-to-coast across the United States since 1918. The moon will completely blot out the sun during the peak of the eclipse in a 70-mile wide strip that runs diagonally from South Carolina to Oregon. On Long Island, the moon will slowly slip in front of the sun at about 1:20 p.m. and cover about 70 percent of it by 2:45 p.m. The celestial show is expected to end by 4 p.m., when the sun returns to its full brilliance. Hart, a Democrat who is running for Oyster Bay Town clerk in November’s election, said even looking at the sun during the eclipse for just a few seconds can injure the retina, leading to permanent vision damage or even blindness. Hart said people don’t normally look at the sun because of its intense brightness. The darkened skies, he said, may fool people into looking directly at the sun. “The 30 percent of the sun that is coming through will burn and oxidize your retina within a matter seconds,” said Hart, who said he fears Long Island eye doctors will receive calls from patients who did not take the proper precautions. 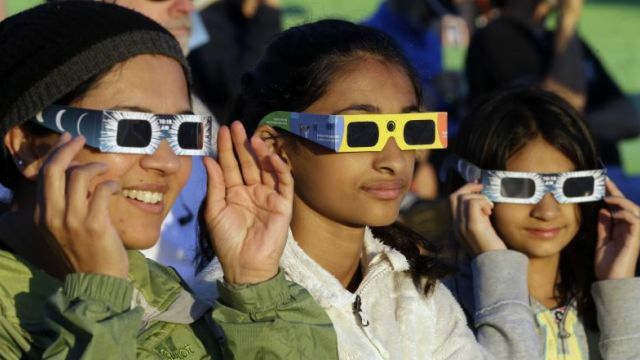 Spencer and Hart said amateur astronomers who wish to look at the heavenly dance between the sun and the moon should use official eclipse glasses that meet the International Organization for Standardization 12312-2 safety guidelines. The glasses should be labeled ISO, they said. Dark sunglasses offer no protection, and viewing the eclipse through a telescope or binoculars will simply magnify the damage to the eyes. Most retailers and online outlets sold their stock weeks ago, and Spencer said science fans should be wary of scams and substandard gear. “There are those who are offering eyewear that number one, doesn’t offer the appropriate protection and number two, there is price-gouging,” he said. Eclipse watchers who don’t have the proper protective eyewear can build eclipse-viewing boxes, Hart said.